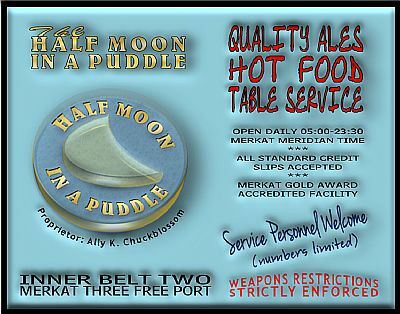 Welcome to The Half Moon in a Puddle! The finest dining experience in the Inner Belts! Find us on Green Level Three of Inner Belt Two! Open during normal business hours and way beyond. Our friendly and efficient staff is always there to welcome you and assure you of the very best service. All tables are fitted with privacy shields and serving hatches for your convenience. Selections of the finest ales and beers are always available. We scour the galaxy to provide you with the best. Hot meals are served all day, every day! Advance orders are welcomed for large parties.